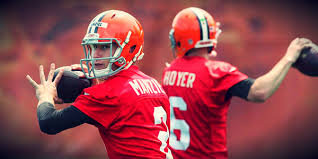 One of the biggest stories in this year’s NFL pre-season was the battle between Brian Hoyer and Johnny Manziel for the starting QB spot with the Cleveland Browns. It was just announced today that Hoyer will be the starter when the regular season begins in three weeks. Since 2000, there have been 19 different players who have started a game at QB for the Browns. How well do you know your Cleveland Browns QBs? 1. Which QB has started the most games for the Browns since 2000? Your choices… Brandon Weeden, Tim Couch, Colt McCoy, Derek Anderson. 2. Johnny Manziel was the third quarterback this century that the Browns selected in the first round of the NFL Draft. Can you name the other two? 3. The last time the Cleveland Browns played in a playoff game was in 2002. Kelly Holcomb was the starting QB in that game. The last time the Browns won a playoff game was in 1994 when they defeated the New England Patriots 20-13. Who was the Browns’ starting QB in that ’94 playoff win? Hint: He played 21 years in the NFL, three with Cleveland. 1. Tim Couch has the most starts at QB for the Browns since 2000 with 45. Derek Anderson is second with 34; Colt McCoy had 21, and Brandon Weeden had 20. 2. The Browns selected Brandon Weeden in the first round of the 2012 draft and Brady Quinn in the first round of the 2007 draft. 3. Vinny Testaverde was the starting QB for the Browns when they last won a playoff game in 1994.